Size matters. Position doesn’t. That’s what a palate-weary Sunset panel decided after blind-tasting more than 50 chickens. The objective: to settle the argument about the best way to roast a bird. The panel came to other critical conclusions as well, as we put the core methods to the test: What’s the ideal oven temperature to produce a chicken that is beautifully browned and crisp and still yields succulent breast and thigh meat? Is the breast really juicier if roasted downward ― even part of the time? Does rubbing the chicken with fat before roasting achieve anything? Is the skin more or less crisp when basted? And ― perhaps the most controversial question of all ― are free-range, organic chickens any more flavorful than their standard commercially reared cousins? We fired up our ovens (even this was eye-opening, as we compared their performances) for a series of side-by-side tests to learn exactly what techniques do and don’t work. Here’s what the scoring revealed. Oven temperature. A constant 425° oven ― regular or convection – produced the crispest, most richly browned skin and juiciest breast and thigh meat. (At 500°, the chicken browned well, but it also spewed a prodigious amount of fat and smoke ― more than you may want in your kitchen.) Starting at a very high temperature, then lowering it, also yielded brown, crisp skin, but the minimal difference doesn’t warrant the step. Chicken position. Starting the bird breast down, then turning it over to brown, didn’t keep the meat any moister. Nor did rotating the chicken from side to side. And in both cases, the skin wasn’t as nicely colored. Rubbing with fat. Smearing the bird with butter or oil before roasting made the skin slightly crisper but had no flavor impact. Basting. Spooning the pan drippings over the chicken as it roasted made the skin less crisp and, again, added nothing to the meat flavor. Free or not. In the most telling taste tests of all, standard commercially reared chickens edged out free-range birds for best flavor. So let your environmental convictions be your guide. 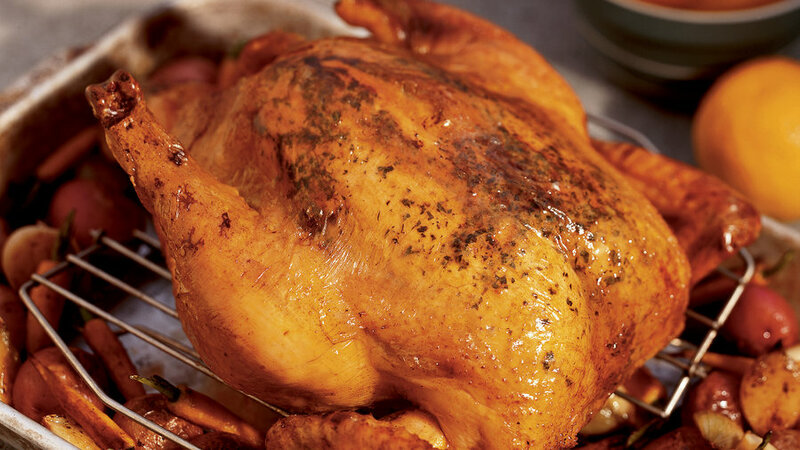 The bottom line: Proper roasting makes any bird delectable. Size. Big chickens ― often labeled roasters (generally 6 to 8 ― have deeper, richer, and more complex flavor than smaller ones. Of course, young chickens (also called broilers and fryers; under 6 lb. and about seven weeks old) can be roasted. But by the time the skin is an appealing color, the breast meat of smaller birds is cooked past its prime. A roaster, however, reaches perfection inside and out at the same time. In fact, everything a roast chicken does well, it does best when bigger. It makes a more dramatic presentation, it accommodates more people, and it provides leftovers for sandwiches, soups, salads, pastas, or just plain nibbles. Best of all, there’s time to cook other ingredients in the pan along with the roasting bird, as we’ve done in the recipes that follow, to create grand chicken dinners. Get local recipes that you won’t find online. Try Sunset today risk-free.